In December 2016, Village of Haverstraw Trustee Emily Dominguez was sworn in after being re-elected as Trustee for her third full term. Simultaneously, Mayor Michael J. Kohut appointed Ms. Dominguez as Deputy Mayor. At last Monday’s Haverstraw Town Board meeting, Supervisor Howard T. Phillips, Jr. and the Haverstraw Town Board made two appointments, both Hispanic women. The first was to fill the vacancy left by the unfortunate passing away of the distinguished Honorable Justice Peter Branti. The second was the appointment of a new town clerk, which is occurring because of the retirement of the Honorable Karen Bulley after a 40-year career of public service. 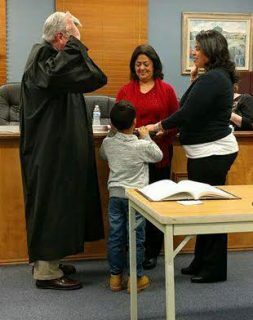 The Town Board chose the experienced prosecutor for the Town of Haverstraw Ivonne Santos, who becomes the first Hispanic town justice in the history of Haverstraw. Appointed to town clerk was the long time deputy clerk for the Town of Haverstraw Raquel Ventura, who will also become the first Hispanic town clerk in the history of Haverstraw. In addition to trustee and now deputy mayor, Dominguez is thef of BLU RIVER marketing, a full service marketing, events planning, and public relations firm. Her clients include some of the top local businesses and non-profit organizations in Rockland County. She also owns Everything Bridal, which hosts bridal shows throughout the Tri-State area. She currently sits as vice president of the Rockland Community Foundation, co-chair of the Haverstraw Neighborhood Fund, a founding member of Women Dine for a Cause and a board member of both the United Way of Rockland County and the Center for Safety and Change. Dominguez has achieved awards like the 2016 Citizens of the Year by the Haverstraw Elks Lodge and the 2014 Women of Leadership and Vision by the Nyack Center. Emily also attend the Yale Law School Woman Campaign School making her the first Hispanic from Rockland County accepted into the program.